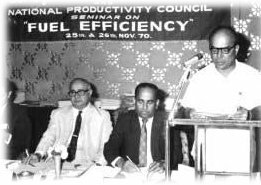 Mr. V.B.Paralkar presenting a research paper on the role of additives in improving the fuel efficiency of boilers at the Seminar on Fuel Efficiency held under the auspices of the National Productivity Council. Unik Chemical Industries was founded in 1964 by the late Mr. Vijay B. Paralkar when he launched KEROSOL - an additive for kerosene oil. The product was targeted mainly at the domestic users of kerosene stoves, then widely used in India. Mr Paralkar had extensively researched the chemistry of combustion and additives and he is the pioneer in the field of fuel additives in India. He had presented several research papers at such prestigious fora as the Bombay Productivity Council, The South India Fuel and Steam Users' Association and the Indian Institute of Technology (Bombay). Till then, fuel additives were not much in use in India and any additives that were being used were imported from the UK and USA. When LPG (Liquefied Petroleum Gas) replaced Kerosene Oil as the preferred fuel in the middle and upper middle class households in India, Kerosol became redundant. Mr Paralkar then launched Residuumsol: Fuel Oil Additive to help users of fuel oil to overcome the difficulties that are encountered in boilers, furnaces and other energy generating equipment using heavy fuel oil. Residuumsol was received by industry in India with lively interest and many reputed industries started using it with very encouraging results. The next decade saw the emergence of several new brands of fuel additives in India, most of which disappeared from the market before too long. At present, Residuumsol: Fuel Oil Additive enjoys a special position and reputation in the fuel additives industry in India which has several brands of additives made by indigenous and multinational companies. The large and ever increasing number of industries regularly using Residuumsol: Fuel Oil Additive in preference over additives made by multinational giants, amongst them some Fortune 500 companies, vouch for the effectiveness of Residuumsol: Fuel Oil Additive in increasing the fuel efficiency of their boiler and furnace installations.